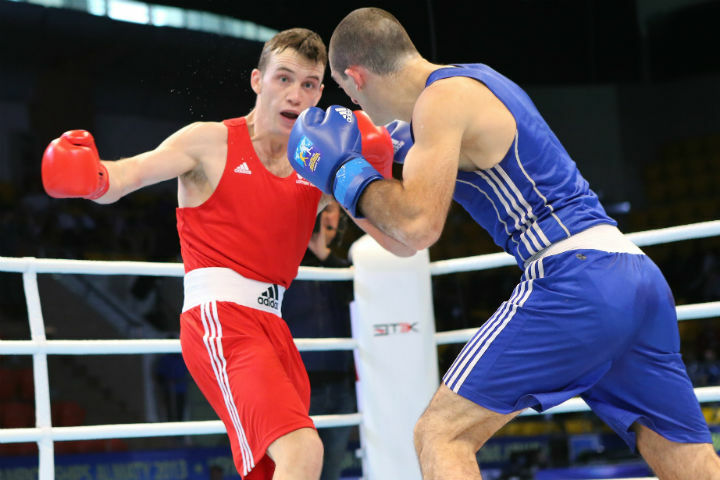 Welshman Freddie Evans battled his way through to the next round of the AIBA World Boxing Championships Almaty 2013 today in a battle with Zaal Kvachatadze of Georgia. We had an interesting session all round this afternoon with several interesting exchanges taking place as the Lightweights (60kg), Welterweights (69kg) and Light Heavyweights (81kg) went in search of glory. Lightweights Dmytro Cherniak of Ukraine and Dmitry Polyanskiy of Russia fought in what proved to be an excellent bout early in the session. Neither fighter was the bouncy sort, both standing firm and looking to trade punches with each other. Who had the edge in this regard seemed to initially change in every exchange, almost as though they were taking it in turns to showcase their prolific combinations. The edge gradually started to go to the Ukrainian and he seemed to land the harder shots. Both athletes embraced at the end in mutual recognition with Cherniak taking the bout 3:0. Freddie Evans of Wales was in the ring today against Zaal Kvachatadze of Georgia. While there was some difficult exchanges in round one for the former British Lionhearts boxer, Freddie got on his bike for round two. The southpaw wasn't at his best, but was nonetheless able to pick his opponent off on the way in and to make use of the whole ring. He didn't let his man come anywhere near him for a substantial period. In the final two minutes of the last round, the Georgian came on however, and worked very hard to change the outcome of the bout. In the end however, it was the APB boxer who went through. "I'm always the same in competition, I'm always a bit rusty on my first fight", said the Welsh. "I fought him before in the 2011 Europeans so I knew what I had to do. Obviously I'm happy that's out of the way, so that I can come out sharper for the next one". Lindolfo Delgado of the Mexico Guerreros had a fairly smooth passage to the next round against Andrique Allisop of the Seychelles. The Lightweight knocked his opponent down in the second with a minute remaining. He allowed himself to cruise through the third when it became clear that the Seychelles athlete had gone into survival mode. "He was a complicated rival, but after the shot that knocked him down he didn't want to attack any more. My coach told me to wait for him at that point so that's what I did", said the Mexican. Elsewhere, the bout between WSB Mexico Guerreros boxer Vazgen Safaryants of Belarus and Baku Fires star Elvin Isayev of Azerbaijan was excellent at Lightweight, with both boxers working incredibly hard. In the end, the Azeri out-gunned his rival for an outstanding result. Rayton Okwiri of Kenya faced Erkinbek Bolotbek Uulu of Kyrgyzstan at Welterweight. He has a very calm and composed style and patiently covered up letting the opponent work before timing his own action. When his coach shouting at him to "work" with thirty seconds left in round two, he was able to respond very impressively. He looked more than capable in the ring and really managed the bout. In the third round he again exploded with a minute to go and it was clear that his opponent was unable to keep pace. The Kenyan took a good victory. "I thought he did an excellent job", said Road to Almaty assistant coach Christy Halbert. "He did everything a good boxer is supposed to do. He kept his composure and his distance was nice, especially when his opponent got tired, so I was very pleased". Sean McComb may not have had the most demanding opponent in Gildas Bangana of the Central African Republic at Lightweight, but the Irishman looked very good today. He is quite tall for the category giving him useful reach, but remains well co-ordinated. He also has fast hands and really good footwork. This makes for a good combination and his work rate was excellent as well. A comfortable 3:0 win for the Celtic boxer. "I tried to stay in my comfort zone today as I didn't want to show my next opponent too much", said the Belfast man. "That's my third contest without a head guard. I'm finding it brilliant actually. I feel looser in there. I have better head movement and much more vision". Roberto de Queiroz from Brazil made his debut performance in a World Championships against Simeon Chamov of Bulgaria at Welterweight. The Carioca who grew up in the Complexo da Maré favela in Rio de Janeiro, lost his father at a young age to gun violence. Boxing has proven to be a way out for him. The orthodox boxer looked very sharp in the ring and worked his jabs well in the first round. He got a cut and also took a standing eight count in the final round, but he battled hard against tough opposition. Clearly a prospect for the future, he was a credit to himself, his team, and the club that nurtured him.